Medieval beat Oscuro to win. El Guason added himself to the match. Kronos & Tornado beat Herodes & Titan. Crazy looking show. Black Terry Jr. has four highlight videos of this weekend’s show: Light Heavyweight title match, Middleweight title match, the maestros match and the tag team title match. Unsure how Terremoto is in the same weight division as everyone else in that light heavyweight match. The running shooting star press into a corner headbutt to the gut is my new favorite stupid move, though the vertical suplex/tope combination is not far behind. Not totally sure about the fifth match results – both recaps heavily praise Belial for keeping up with the CMLL guys to the point that they’re not really clear (to me) on how the match turned out. Tecnicos took 2/3, Stuka beat Mistierioso. The newspaper recap believes Marco & Rush get the title shot, though CMLL had previously said this is was the first block of a tournament. They both may be right. Marco & Rush make sense against Casas & Shocker. 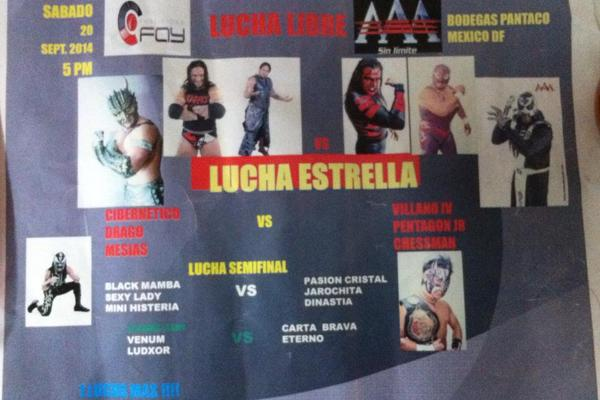 Today’s CMLL show has a main event of Marco, Mascara Dorada, Titan and Shocker, Ephesto and Hechicero. Some good matchups there. Silueta and Marcela return from Japan to team with Lluvia aginst Dallys, Amapola, and Seductora – Lluvia and Dallys had issued last week. Lightning match is Dragon Lee versus Virus, which could be very good. The all Jalisco team of Atlantis, Rush and Valiente take on Laguneros Euforia, Gran Guerrero and Ultimo Guerrero in Arena Coliseo Guadalajara. Mascara and Mephisto meet in a singles match. September 16th, two weeks from today, appears to be the big day for holiday shows this year. They’ll be setting up something on both of these shows (and have a lot of possibilities.) That following weekend looks busy too; there’s a Mil Mascaras show at Arena Lopez Mateos on 09/21. Segunda Caida reviews Angelico, Zumbi & Australian Suicide vs. Los Infierno Rockers from February. SuperLuchas #532 has the Rock, Ultimo Guerrero and Hector Guzman on the cover. Myzteziz says he’s going to be the one to stop Perro Aguayo Jr.
Metalico wants a hair match with Rey Cometa, Blue Panther or Virus. Ultimo Guerrero is #1 on CMLL’s top 10. Hombre sin Nombre is #10. Amapola & Zeuxis promote the Anniversary show. There’s a video clip of the interview as well. Drago and Pentagon Jr. are listed on a DF show on 09/20, so maybe they’ll be headed back to Mexico on the weeks with no Lucha Underground taping? Nosawa, who’s already planning on Mil Mascaras for a December 11th show, says he’s negotiating with Alberto del Rio as well. Nothing is signed yet. Video of Star Fire’s debut in Japan. My cable went out during the end of the IWRG Prison Fatal match. They didn’t air Dragon Celestial/Hip Hop Man; Dragon Celestial’s promo air, but they went straight to the next promo from there. I think other programming must’ve gone long, but they were just airing reruns after it so I dunno. I’ve got last week’s C3 and this week’s C3. This week show is off the Canal44 feed, so they get in and out of breaks late and I screwed up the first fall of the first match while seeing if the recording was actually working it. (It was, up until I did anything.) I should have a better version of that match later. Noches de Coliseo did not air any new matches. Thanks to everyone for their help, as always.